Handmade Jewelry from semi-precious stones, Swarovski crystals, pearls and more. Welcome to Beads Fairy Creations! Beads Fairy has been making wonderful beaded jewelry for delighted customers for many years now. 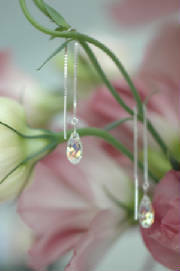 Our customers know that Beads Fairy jewelry are painstakingly handmade with only the highest quality materials found. Beads Fairy does not mass produce any piece of jewellery, but are individually hand made piece by piece. Some of our exclusive designs are limited to only one or two pieces. Only you or that special someone deserves to have something this exquisite. **Singapore buyers can email for special prices. Handmade Jewelry Web Ring Please Visit S. R. A. Inc.